The Battle of Britain Memorial Flight is a standing reminder of the heroism and sacrifice of countless British and Commonwealth aircrew who flew and fought during the Second World War. Formed at RAF Biggin Hill on July 11, 1957, as the Historic Aircraft Flight, today the BBMF’s incredible collection of aircraft includes six Spitfires, two Hurricanes, one of only two airworthy Avro Lancaster bombers in the world, a Douglas C-47 Dakota and two de Havilland Chipmunks. The Flight’s Second World War aircraft have survived against the odds to exist in flying condition today and this publication charts each of their careers over the last seven decades or more. 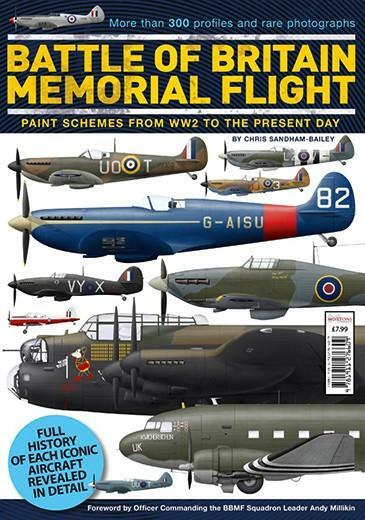 Author and illustrator Chris Sandham-Bailey has meticulously reproduced every known paint scheme worn by each of the aircraft - as well as gathering together an unrivalled collection of photographs to show how the appearance of the aircraft has changed. Never before have all of the BBMF aircraft liveries from the war’s end to the present day been catalogued and illustrated in one publication. Here you can see them both as Chris’ aircraft profile artworks and in rare photographs. This publication is a must for anyone with an interest in the BBMF aircraft and their histories. Be the first person to tell us what you think about Battle of Britain Memorial Flight and you'll save £2.50 on your next purchase!